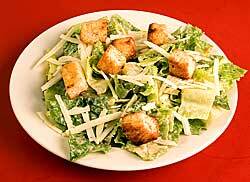 Crisp Romaine Lettuce, homemade Croutons, Grated Romano Cheese tossed with our own Caesar Dressing. 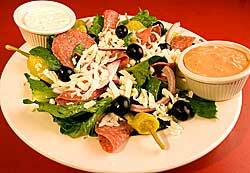 Lettuce, Tomatoes, Ham, Salami, Mushrooms, Green Peppers, Onions, Chicken Breast & Mozzarella Cheese. Lettuce, Tomatoes, Artichoke Hearts, Pepperoncini, Corn, Chicken Breast, & Mozzarella Cheese. Tomatoes with sliced fresh Mozzarella, Sun-Dried Tomatoes, Fresh Basil and Greek Olives, Drizzled with Extra Virgin Olive Oil.